Yorkshire Terrier December 30, 2018 April 12, 2019 No Comments on How Often Should You Bathe a Yorkie? There is no strict rule to determine the frequency of bathing Yorkie. It is the most important grooming requirement for your buddy. There are many factors involved in the type of Yorkie’s skin and kind of haircut, in determining and planning a bathing routine for your dog. First of all, you need to take a look at your personal routine and then think about how you will merge that with your Yorkie’s routine. This will prove to be easier for you to inculcate your dog’s routine in your daily/weekly tasks. The simple rule is that if you have opted for long hair for your dog then you have to bathe him once in a week. Otherwise, it is fine to bathe your short-haired Yorkie once every three weeks. 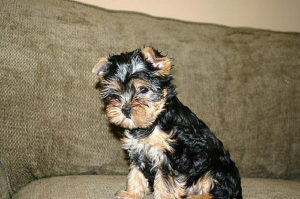 It is also recommended to bathe a Yorkie with dry and sensitive skin, less frequently. In cold weather, Yorkie’s skin is more prone to dryness. You are, therefore, advised to bathe Yorkie less often. Also, choose the shampoo carefully. You are advised to use specially formulated shampoo for dogs, suitable for your Yorkie’s skin type. In certain cases, it has been observed that there are some puppy owners, more prone to allergies and skin infections. In such a case, you have no other option to keep your dog clean and bathe him immediately after in contact with the outer environment, dirt, and germs. Even then, it is advised to not to bathe him daily but according to need. In the end, the final verdict is that you are the one who knows best for your dog. After two or three months, you actually learn a lot about your dog’s individual personality, routine, traits, and preferences. You train and groom your dog according to your own routine and character. Hence, you can then rely on your instinct and choose best for your dog!